There are 86400 seconds in every day. That means every day is rich with 86400 opportunities to fulfill your God-given purpose. 86400 is the instigator that will inspire you to live a renewed life of intention, ultimately managing your unique purpose to make a difference for others as well as for yourself. Starting with personal accounts of her own challenges with time management and her search to find meaning amidst her success and achievements, Lavaille Lavette provides ten characteristics she has discovered to help discern the value of each moment of the day and fill it with unique purpose. Each characteristic is exemplified by a noteworthy person who has earned accolades in his or her field of endeavor. Interviews with these and other remarkable individuals provide practical advice and demonstrate how purpose management empowers you to master your time and your reason for being. While managing your time will help you become more efficient at what you are already doing, this breakthrough approach shows you how to weave together a life that overflows with intention and relevance, that feels natural and sustainable. It challenges you to use those precious 86400 seconds of every day to live your passion, achieve your goals, and become all that the Creator ordained you to be. 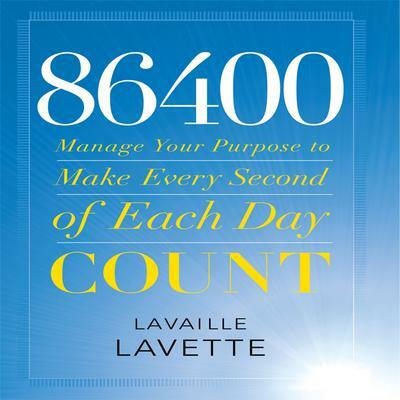 Lavaille calls this process “purpose management.” 86400 is where time management meets purpose, empowering you every moment of every day.